And people thought homework was frightening. Harrington High School is your average Midwestern high school, and really just your average high school. Stereotypical teens fill the halls, like the pipsqueak geek Casey (Elijah Wood), popularity queen Delilah (Jordana Brewster), star quarterback Stan (Shawn Hatosy), goth outcast Stokely (Clea DuVall), held back lowkey-genius and drug dealer Zeke (Josh Hartnett), and new southern belle MaryBeth Louise (Laura Harris). Of course, there is The Faculty; the average authority figures from the nurses and teachers to the football coach and principal. After something truly alien is found on the school football field, the student body begins to see that the faculty are starting to act very strange. Is it stress? School budget problems? Or has Harrington High been chosen as the site for an invasion by unearthly beings? 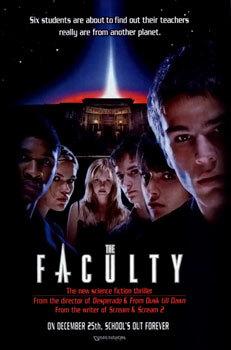 The Faculty sounds like a Goosebumps title from the 90’s, and it is fitting that it released in 1998, just a year after the original series ended. While it would be right at home as a title in that series, this movie and its director take much inspiration from other preexisting cinema works. Take a small dash of The Breakfast Club, mix in a teaspoon of Men in Black and The Outer Limits, and roughly a pound of The Thing, and the finished product is The Faculty. For about a solid third, the movie seems to make an attempt to be its own movie. There is some time spent on the characters early one and who they are, along with some half-hearted attempts to show that these characters aren’t the average stereotypes. Doesn’t work, because they still are. This plays into the slow start found here. There’s a lot of down time between the attention-grabbing opening and the next intriguing scene. There comes a point in the movie though when Rodriguez decides to stop trying to even give this a shred of originality and chooses to fully steer The Faculty into territory that films that came before it locked down. As terrible and as negative that may sound, it actually is a positive for the most part. Just do not expect this to be full of frights. A few jump scares exist, but if the movie’s scares were put in the context of a pepper on a heat scale, they would essentially be a bell pepper, the weakest of all peppers. Whether it be from a lack of truly horrific atmosphere or something else, little will make the heart beat. Consider this more of a campy flick with plenty of tongue-in-cheek references, along with special effects that are extremely dated now and probably dated when this was first released. Anyone who is a fan or familiar with John Carpenter’s extraterrestrial horror will know specifically what Rodriguez is paying homage to during two scenes in particular. Even the ending, which wraps things up way too nicely with still shots over accompanying 90’s music (It’s Over Now), is so bad it’s good, reminiscent of those coming-of-age films that always seemed to end with some type of soft, pop/alt rock where the film freezes on one scene. A cast may not make a movie, but yours truly would be remiss if I didn’t mention that one of the key reasons why The Faculty is passable is because there is so much fun to be had in seeing a huge, name-filled cast now in the same movie. Of course, this didn’t have the benefit of the “this is where he/she got their start” back in ’98 like it does now, but time shapes things. 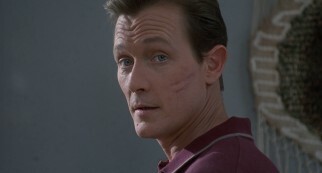 None of these actors may be truly A-list these days, and some like Hartnett and Hatosy didn’t reach the stardom that seemed certain, but many have made more than respectable acting careers from this, including Jordana Brewster, Famke Janssen, Salma Hayek, Clea DuVall, and Elijah Wood. Hell, Usher and Jon Stewart, who are big-time stars in this world, make notable appearances here. The acting can be shoddy and inconsistent, but casting-wise, no one looks out of place as a teacher or student, and everyone looks happy to be there. 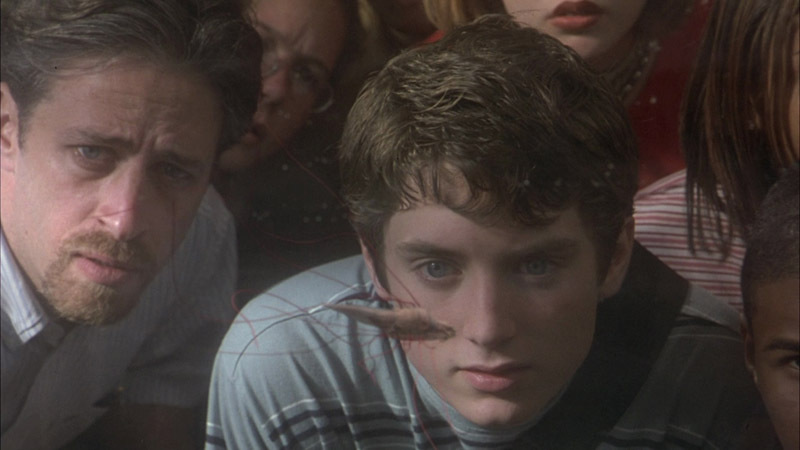 Unoriginal, scare-lacking, yet respectably enjoyable, The Faculty ultimately isn’t a bad trip down memory lane. It’s a nice and light way to get an 80’s, but especially 90’s nostalgia kick. Photo credits go to Wikipedia.com, fanpop.com, dvdizzy.com, and fancarpet.com. Yeah I thought that was Jon Stewart I spotted in that image up top. Lol! This one sounds. . . not really my thing, but the cast is pretty damn impressive all the same. Nice! Nothing wrong with that. It’s a light movie that you don’t need to see, but won’t be completely terrible if you ever catch it! I’ve never seen this one Jackson but it sounds like it might be worth watching next time it’s on tv. I’ve seen this on SyFy a few times, so I know here and there they play it. I saw it last weekend on Cinemax during a free trial provided by my cable provider lol! Like most of the horror films that came out around that time, it’s fun. However, it’s just that. Nice review. You got it Dan! Not saying much, just an amusing, pretty average-made Rodriguez film.